At Bilsthorpe Flying High Academy we believe that reading skills are important factors towards every child's success in school and their future. In addition, reading can be a fun and imaginative activity for children, which opens doors to all kinds of new worlds for them. Identify main ideas and themes in a wide range of books and understand how these are developed over a text. Identify how structure and presentation contribute to meaning. Make comparisons within and across texts. Identify how language contributes to meaning. Feel free to use these skills to question your children when listening to them read. Skills and strategies to read for understanding. For more information on reading throughout the school, please find our reading guide for parents document below. A wide range of books shared by real people...let them read a book to you! Myths and Legends read out loud...are you brave enough to listen to them? Amazing selection of audio books for free! A child's development in reading comes down to two parts: reading the words & understanding what they have read. We understand that sometimes children may be reluctant to read at home, to help overcome this we have some top tips to help engage readers and create a positive reading atmosphere at home. Introduce a reading rewards chart at home, celebrate when your child is reading with them and work towards a goal or reward. There is an example reading chart below for you to download and use at home if you want! Encourage them to read to animals if possible, sometimes readers may be reluctant as they are self-conscious of their reading ability, sometimes reading to an animal who is not going to "judge" them can help to build their confidence. Creating a quiet, comfortable reading space. Giving children a special area all to themselves helps to make reading fun and pleasurable, in Year 4 the children like to dim the lights, put their feet up and put on some calming music. Encourage reading in lots of setting, who doesn't love to relax in the park/ on the beach with a good book? All staff at Bilsthorpe Flying High Academy are eager to hear your amazing ideas and celebrate every child's achievement. If you try out one of these ideas take some pictures and bring them in so we can celebrate with the children! In a special corner of every classroom at Bilsthorpe Flying High Academy, you will find an place dedicated specifically to reading. 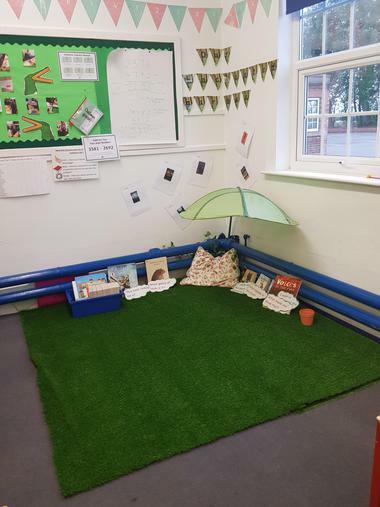 As reading is such an important skill, we have created these corners to promote reading for pleasure and to ensure all children enjoy their time spent reading. Yea 1 have a cosy area called the "Reading Garden" which the children enjoy using the models and puppets available to tell their own stories! Year 2 have an amazing beach scene, who doesn't love to relax in paradise with a good book? Year 3 have an amazing signpost to send them off into lots of different fictional worlds, ad they get to enjoy cuddling up inside their own tent filled with cushions! Year 4 have created a reading garden to lie down on and relax in. Year 5 get to read beneath a Japanese inspired cherry blossom tree in a comfy leather chair! The branches are even full of recommended reads. Year 6 have a safe and warm area set underground, they can crawl underground to stay safe from natural disasters or even world wars!